We were shown some pre-alpha gameplay in plague ridden Whitechapel. Humans you meet are a point of tension in the game. Killing other Vampires, especially those who're from degenerate, more bestial classifications of bloodsucker, will be routine, but humans have families and friends. They have roles to play. They're sources of information for your ongoing investigation, points of contact for the community. If one dies, the world could be better or worse off. They're also your food. They're the way you survive. They're the way you get stronger. See, the designers intend for you to get most, if not all, of your XP from draining humans. If you never do, you won't get much at all. "You have to choose who you kill carefully," said Phillippe Moreau, the game's Director. "You can be Dexter, and only kill the bad people, but it's up to you to decide who the bad people are. That is not always clear." The designers really emphasized an investigative aspect to the game. If you want the "best" game endings you have to look into peoples' lives, talk to them, and try to pick off only the worst of human society. It sounded like those game endings can vary both in the fate of London and in Reed's fate, but it wasn't quite clear how that boundary falls. I asked if you could kill nobody at all, and the answer was yes - but the game would be very hard. "Remember," said Moreau, "people are your food, your experience points for abilities." I guess if you starve yourself you can't grow much muscle. But both Moreau and Beauverger were clear: You're never forced to kill someone. Each death is blood on your hands. Blood you have to put there yourself. It's clearly a post-Souls action RPG, with methodical button presses emphasizing timing over clever combos and hack-n-slash influences. 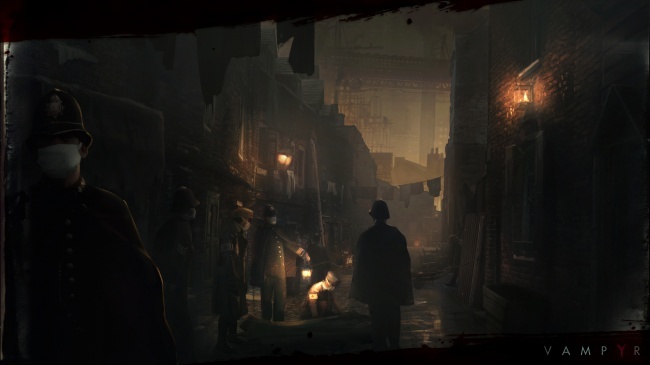 I'm sure it'll draw comparisons to Bloodborne, since pistols find their way into the knife and saw play, but since this is Georgian London, not Victorian, those won't be quite accurate. Sure, they've got blood in common, but this is a much more character-driven, humanist style of storytelling. Not to mention the lack of die-repeat gameplay. I'm most excited about the dark, Gothic-influenced Romanticism at work. The Vampire is at its best when it's a predatory, sexual creature that lives with its status as both human and monster, not an angsty superhero. That's why Bram Stoker's Dracula has such enduring popularity. That's why the World of Darkness took off. As I watched Doctor Reed speak to the soldier who'd shot at a boy in the street, I was thrilled that the option to use Vampiric mesmerism on him was labeled "Seduce." Reed places his hand on the small of the confused man's back, almost tenderly, and leads him by the shoulder into a darker alleyway. He steps up behind him, holding him close, and bites into his neck. The man screams, then quiets. "It's okay," his whispered voice says, "I died in France a long time ago." For a studio that just finished a teenage drama, this one's going to some dark places. 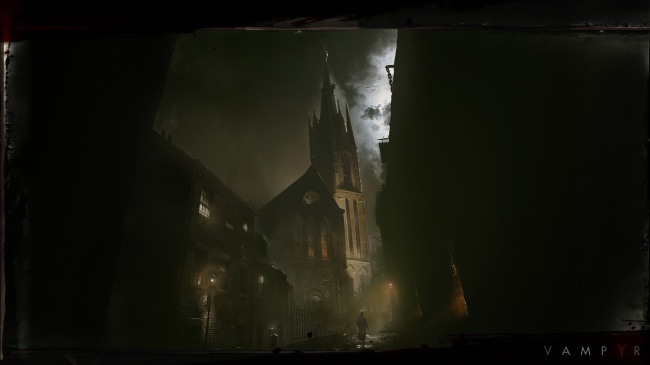 Vampyr is still in active development, projected to release no sooner than mid to late 2017.